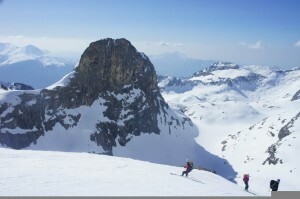 This classic ski traverse takes you to the two highest peaks in the Pyrenees – the Posets (3368m) and the Aneto (3400m). 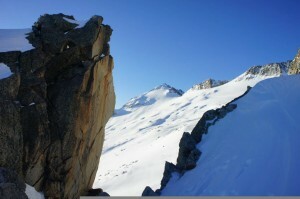 The Aneto was first climbed in 1842 by a Russian army officer, Planton de Tchihatcheff. The Posets was reached in 1856 by H. Halket with a group of guides from Benasque. Both mountains are now protected at the heart of the Maladeta-Posets Nature Reserve and are linked together in a six day traverse in the Aragonese mountains on the Spanish side of the Pyrenees. 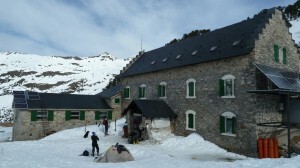 You stay in a variety of different refuges and ski a peaks and passes along the way including Peak Alba (3107m), the Collado Perdguero, the Collado de la Paul (3050m) and the Portal de Remune. 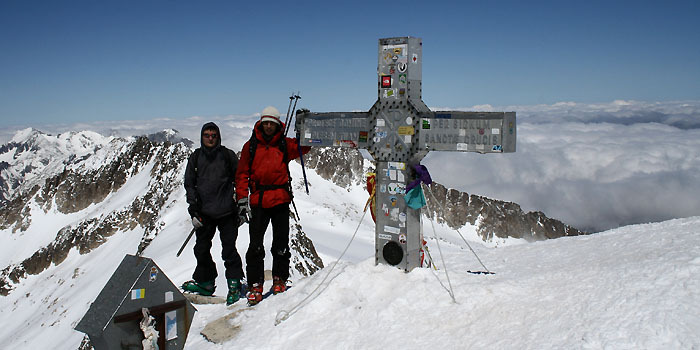 This ski tour will particularly appeal to people who have already skied along the French Pyrenees National Park trail and could be done by most people who have completed one or two ski tours before – but you need to be in good shape. Price: 1395€pp includes accommodation, dinners, breakfasts, picnic lunches, transfer from Toulouse and return. Extras: Hire gear (190€ for the week + 80€ for avalanche pack). Day One: Fly or train to Toulouse where we organise collection station and transfer you to Viella for our first night. We spend the evening checking equipment and going over the itinerary. Day Two: Transfer to Benasque and up to the Hopital de Benasque. From here we climb to the Renclusa refuge where we will spend two nights. We leave our gear at the hut and travel with light bags to the Pico Paderna and a first descent back to the hut. Day Three: Aneto is the highest peak in the Pyrenees - and we tackle this today. Leaving the hut early we head up the steep slopes to the Portillo Superior. A short abseil brings us down onto the wide glacier slopes that lead across to the Coll de Coronas. From there we cross the rocky arette (known as Mohamed’s Stairway) to the final summit of Aneto (3403m) itself. Then we ski 1100 metres down the broad slopes to the Plan del Aigualluts before climbing to a small ridge to ski back to the Renclusa hut. A big day! Day Four: From Renclusa we head due west to the pinnacle Pico de Alba. The final summit is climbed on crampons. From the peak we ski steeper north facing slopes down through the Valle de Alba and back to the Hopital de Benasque. Day Five: We ski or hike along the GR11 trail to the Valle de Lliterola and then skin up along the Barranco de Remune to the Ibon Blanc at 2848 metres. This is followed by a descent to the Cabana del Turmo before skiing up to the Estos Refuge. Day Six: The route from the Estos to the Angel Orus hut takes us through dramatic and remote mountains as we cross the Collado de la Paul and ski down through the Valle d’es Ibons. For those who have energy to spare there are numerous options to climb the odd peak on the way. Day Seven: The last day of the trip takes us to the summit of the Posets (3369m) via the Valle de Llardaneta and the Diente de Llardana. 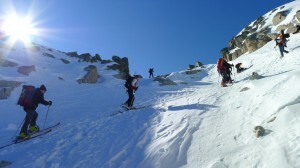 The climb ends on steep slopes but it is possible to arrive at the summit on skis. From the top we ski down great slopes on the west face of the mountain to the tiny farming hamlet of Viados and a rendezvous with our van. Day Eight: You are transferred back to Toulouse airport or train station to connect with transport home.